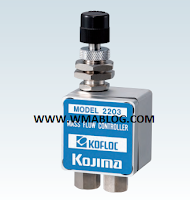 A flow controller is a differential pressure regulator designed to control minute gas flows with precision and keep a certain constant flow rate. 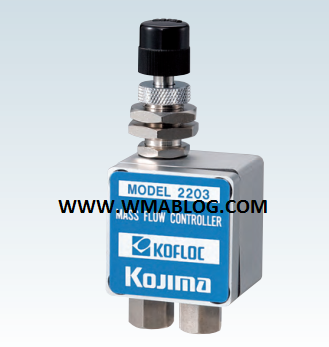 Model 2203 Variable Secondary Pressure Flow Controller is a control valve that keeps mass flows at a constant rate under a given constant level of supply pressure even when the load pressure on the secondary side (outlet side) fluctuates, and its construction is designed so that the performance of its precision control over flows to the set flow rate is maintained by the incorporated precision needle valve without being affected by such fluctuations. A non-rotary needle valve composed of high-precision components ensures smooth control of minute flows. The incorporated precision needle valve protects flows from being affected by secondary or outlet pressure fluctuations, so the product is a 'must-be' tool in the first stage of any flow control line. All the components are super-cleaned before assembly so that the product can be safely used even on instruments for analysis for which cleanliness is essential.